I love polenta. Long ago I bought pre-made polenta in the store. The older Italian lady behind me scolded me for buying pre-made over store bought. That caused me to want to make great polenta at home, from there, the possibilities of dinner ideas is endless. 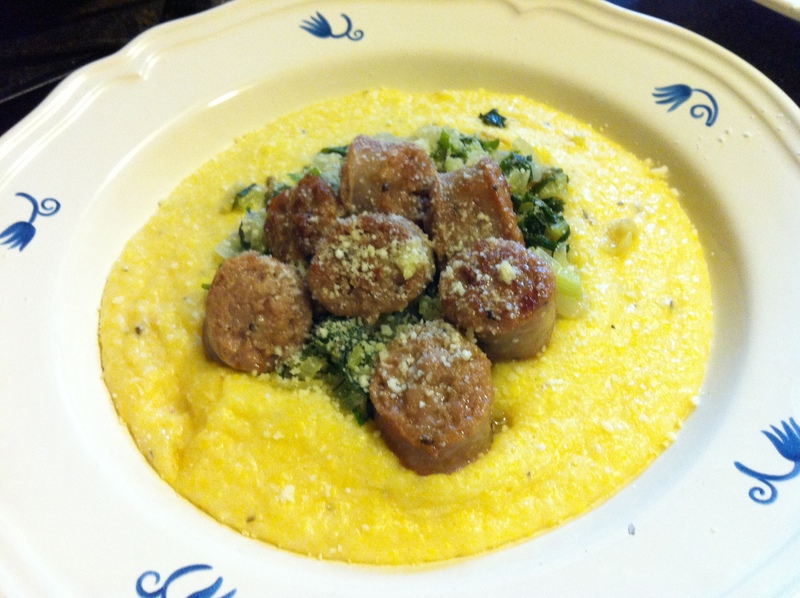 Here’s the basic polenta recipe I use. Bring 6 cups of water to a boil in a large pot or deep pan. Add salt. Turn off the heat. Add the butter and parmesan cheese. While the polenta is cooking, I prep the toppings. You can really use anything you want, any type of meat, poultry or vegetable. Heat oil in a large pan and cook the sausages. Removing from heat when almost complete. Cut the sausage and return to the heated pan for grilling. This will soak up all the flavor and cook them more complete. Remove sausage, add swiss chard to pan and sauté until completely wilted.